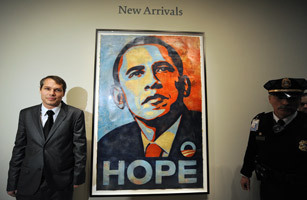 It looked as if street artist Shepard Fairey had all his ducks in a row when he filed a claim against the Associated Press in February citing "fair use" of a photograph he turned into the immensely popular 2008 "Hope" poster of then presidential candidate Barack Obama. Fair use allows for limited usage of copyrighted material as long as it is sufficiently transformed from its original condition. Contrary to the AP's assertions, Fairey claimed that his poster was based on a photo in which Obama was seated with actor George Clooney  and that the cropping and editing justified fair-use protection. But on Oct. 19, he admitted that, as the AP had alleged, the poster was based on one of the agency's photos, taken by Mannie Garcia, in which Obama was seated alone. Fairey also said that when Garcia first raised a ruckus about copyright infringement, he mistakenly thought he had used the Obama-Clooney picture, but he did not rectify the situation and tell the truth upon realizing his error. Instead he admitted to destroying evidence and creating false documents to support his story. Even so, Fairey contends that the origin of the photograph does not change the transcendent power of what he created. The AP disagrees: "It is crucial to protect photographers, who are creators and artists. Their work should not be misappropriated by others."